20 May 2013 – Study visit to Slovenia on “Transparency and Accountability of Public Finances Managing at Local Level” was organized from 13-17 May 2013 in the framework of the project “Strengthening Mechanisms for Public Finances at Local Level in Montenegro” implemented by the UNDP Office in Montenegro, in partnership with the Ministry of the Interior, the Ministry of Finance and the Union of Municipalities of Montenegro. The Study visit is a third organized within the project. It is continuation of a number of seminars focused at the improvement of capacities of municipal secretariats for finances by providing trainings, on-job trainings and exchange of knowledge peer to peer. Participants were introduced with the basic public finances in Slovenia, its regulatory framework for local self-government financing, local budgets’ revenues and expenditures structure and planning, taxation principles, municipal treasury functioning, financial reporting and audit, public procurement’s principles and soon. 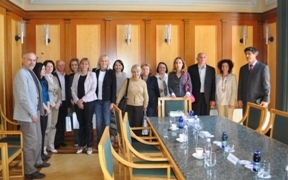 Montenegrin delegation was consisted of Mr. Dejan Klikovac, Municipality of Bar; Mrs. Srđana Milićević, Municipality of Budva; Mrs. Jasmina Pejović, Municipality of Tivat; Mrs. Olgica Glomazić, Municipality of Plužine; Mrs. Nataša Radulović, Municipality Danilovgrad; Mr. Stojan Mitrović, Municipality of Andrijevica; Mr. Vukić Fuštić, Municipality of Mojkovac; Mr. Snežana Mugoša, Ministry of Finance; Mr. Jelena Mrdak, the UNDP Office in Montenegro and Mrs. Žana Đukić, the Union of Municipalities of Montenegro. Participants visited municipalities of Gornja Radgona, Murska Sobota, Nova Gorica, Miklavž, Trzin and Slovenska Bistrica. The municipal representatives warmly welcomed the Montenegrin delegation. They showed an interest for cooperation with our local self-governments.